We are thrilled to share this exclusive Calistoga appellation lot, as it is a true example of our terroir at the pinnacle of the Napa Valley. With a warmer climate than the rest of the valley, this Cabernet Sauvignon displays bright notes of raspberry, cherry, plum and rose petal, with soft, supple tannins and a fleshy mouthfeel. The wine will be aged for 22 months in new French oak. A northern California native, Rob grew up in the vineyards of his family's winery in Sonoma County. After receiving his degree in viticulture and enology from the University of California, Davis, he launched his winemaking career at Groth Vineyards & Winery in the Napa Valley. As assistant winemaker to Nils Venge at Groth, Rob was on the winemaking team that earned a perfect 100-point score from Robert M. Parker, Jr., for the 1985 Groth Reserve Cabernet Sauvignon. Rob later became winemaker for Robert Keenan Winery in the Napa Valley and over his 30-year career has been winemaker for such stellar wineries as Lyeth, Markham and Sterling. He also makes wine for his family's winery, Robert Hunter Winery, and has been a consulting winemaker for a number of other wineries in the Napa Valley and Sonoma County. 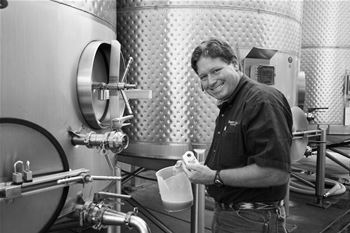 Rob first joined Bennett Lane Winery in 2005. He works closely with proprietors Randy and Lisa Lynch and the rest of the Bennett Lane team to deliver wines that have earned both critical acclaim and a loyal customer following. Robb left Bennett Lane in 2010 to pursue some personal projects, but missed the partnership with the winery and returned in 2013. Within the Napa Valley, Rob has a deep appreciation for the Calistoga AVA and what it can bring to his finished wines. His collaboration with Bennett Lane allows him to explore this unique terroir and its hallmark characteristics in wines that are lushly-textured, with great concentration of flavor and complexity. Rob's fine-tuned palate, meticulous attention to detail and extensive experience with Napa Valley grape growing and winemaking enable him to craft wines that express their vineyard origins and that display notable elegance and richness.